Unless you take turmeric as a supplement or make Indian food for dinner everyday, it can be quite challenging to get the bright yellow spice into your diet. As with most nutrients, turmeric is better assimilated by the body when it is eaten in a meal, in which other nutrients can help the body absorb all of the different components of whole foods (if you do take a turmeric supplement, try taking it with your meals as opposed to on an empty stomach to increase absorption). Pepper and ginger, in particular, increase the absorbability of turmeric by 2000% (study by G. Shoba, D. Joy and T. Joseph published in Planta Medica in 1998). Dr. David Servan-Schreiber writes about the groundbreaking studies that have been done on turmeric in his book Anticancer, A New Way of Life, many of which have focused on curcumin, the compound in turmeric that prevents the development of tumors and inhibits the growth of a variety of cancers. 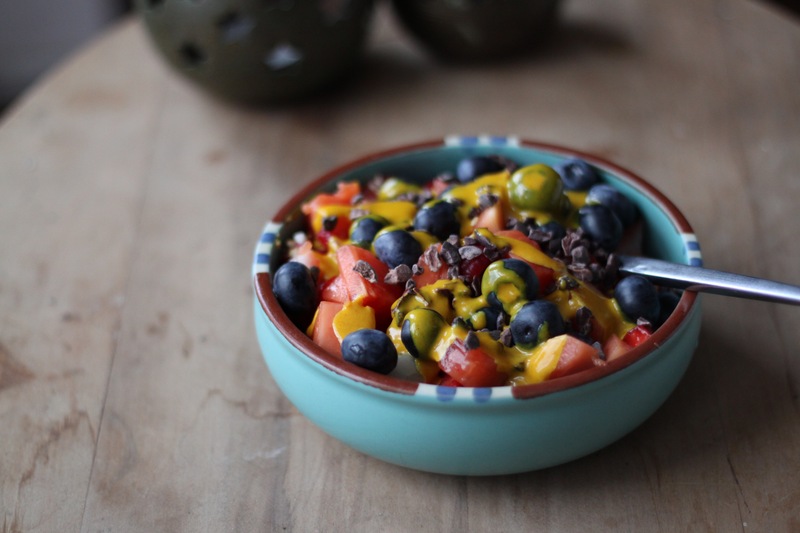 The following recipe is an easy way to surprisingly incorporate turmeric into breakfast! This makes 1 serving. You can make larger batches of the recipe and store in the fridge to have for other meals. 1. Mix all of the turmeric cream ingredients together. Add a few spoonfuls of water to the mixture gradually to make a consistency that can be easily poured. 2. Combine the other components of breakfast in a big bowl- yogurt, granola, fruit. Drizzle turmeric cream on top.